Kirk and McCoy walk into a bar, but this is no joke. The captain gets the cold shoulder from his graduating class, who all seem a bit miffed that he’s killed their friend Ben. Kirk calls BS and takes off, leaving McCoy without a wingman. He flirts with a lovely lady in a hideous dress and learns she’s already an old flame of Kirk’s: Areel Shaw. Damn, turns out McCoy’s a doctor, not a lover (at least for tonight). Kirk is questioned in a pre-court martial inquiry on the charges of “perjury and culpable negligence,” with the computer recording his responses. We find out that Kirk and Finney had a history together; they were once good friends at the Academy, close enough that Finney named his daughter Jame after Kirk. But when they were both assigned to the U.S.S. Republic, Kirk discovered a mistake of Finney’s that could have destroyed the ship, and reported it—sending Finney to the bottom of the promotion list. Finney resented Kirk for ruining his chances at a command of his own. He may have blamed me that he never rose to command a ship, but I don’t assign jobs on the basis of who blames me. It was Finney’s turn, and I assigned him. He had just checked in with me from the pod when we hit the leading edge of the storm. Not too bad at first. I signaled a Yellow Alert. Then we began encountering pressure, variant stress, force seven, the works. I finally signaled a Red Alert. Finney knew he had a matter of seconds. I gave him those seconds and more. But apparently it wasn’t enough. But there’s still the matter of the computer records, which show Kirk is either mistaken or lying, since “computer transcripts don’t lie.” Stone offers him an out, by copping to physical exhaustion and a mental breakdown and accepting a ground assignment, but this is more to protect Starfleet’s image than Kirk, since apparently he is the first captain to be on trial. 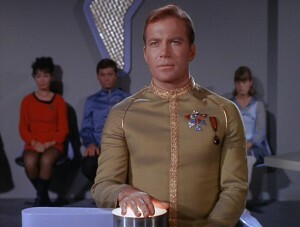 Kirk is insulted and demands an immediate general court martial. Kirk runs into Areel Shaw at the bar (still in her ugly green dress) and tries to pick up where they left off “four years, seven months, and an odd number of days” ago. She reminds him that she’s a lawyer, which should really interest him right now, but Kirk is more drawn to her other talents at the moment. She tells him that they’re going to make an example of him to clear the service of the scandal and recommends a good defense attorney, Samuel T. Cogley. Then she finally admits that she’s the prosecutor who has to disgrace Kirk. She doesn’t seem terribly happy about it. Kirk returns to his quarters and discovers he won’t have to spend the night alone after all: Cogley is waiting for him there to offer him his professional services. As an attorney at law, that is. And he’s brought some bedtime reading, piles and piles of legal books. Finally—the court martial! With Stone presiding over the trial and three of Kirk’s peers on the court, the computer reads off the charges: “Charge, culpable negligence. Specification in that on Stardate 2945.7, by such negligence, Captain Kirk, James T., did cause loss of life, to wit, the life of Records Officer Lieutenant Commander Finney, Benjamin.” Kirk pleads not guilty and prosecutor Shaw calls Spock to the stand. She asks him some questions about the Enterprise computer, which he is qualified to answer because he sounds like a computer himself. Though he agrees that the ship’s computer seems to be functioning correctly, he maintains that it’s wrong anyway and insists that Kirk is incapable of acting “out of panic or malice,” according to his “half-Vulcanian” logic. Firstly, I am at a loss to explain the errors in the extract from the computer log. We were in an ion storm. Everyone here in this court knows the dangers involved. I was in command. The decisions were mine, no one else’s. Charges of malice have been raised. There was no malice. Lieutenant Commander Finney was a member of my crew, and that’s exactly the way he was treated. It has been suggested that I panicked on the bridge and jettisoned the ion pod prematurely. That is not so. You’ve heard some of the details of my record. This was not my first crisis. It was one of many. During it, I did what my experience and training required me to do. I took the proper steps in the proper order. I did exactly what had to be done, exactly when it should have been done. He continues to stand by his actions and take responsibility; more than that, he says he would do it again, exactly the same way, because, he says, “nothing is more important than my ship.” Presumably he also means the Enterprise’s crew, most of them anyway. Shaw cross-examines and presents a particularly damning piece of evidence: a visual log from the Bridge that clearly shows Kirk pressing a button marked “jettison pod” while the ship is still at yellow alert. (Now we know another of the yeoman’s important duties, running around with a label maker to update the button when its function changes in each episode!) Oh crap. For a moment, even Kirk seems to doubt himself, and Cogley is really confused. When the court adjourns to arrive at their verdict, Cogley tries to convince Kirk to change his plea, but the captain is still certain of his actions. Spock contacts him to tell him that a megalyte survey on the computer failed to turn up any problems. (When even the megalyte scan fails, you know you’re in trouble!) Kirk thanks his first officer and shows he can still make light of the dire situation: “It’s not all bad, Mr. Spock. Who knows. You may be able to beat your next captain at chess.” Of course! CHESS. Or is it…poker? No, it’s chess! And it gives Spock an idea: they can blame it all on corbomite. No, wait. That would never work. On the starbase, Jame visits Kirk and apologizes for blaming him for her father’s death. She’s reconsidered, now that she knows they used to be good friends. On the Enterprise, Spock has been playing chess with the ship’s computer. McCoy discovers him and calls him cold-blooded for playing games while Kirk’s career is on the line, which Spock naturally takes as a compliment. He explains that he’s just won four games—make that five—which shouldn’t be possible because he programmed the computer himself. Unless he foolishly programmed it to create an adversary capable of defeating him, which is impossible, the best he could have hoped for is a draw in each match. Spock and McCoy run to the court room to share their new evidence of computer tampering, just in the nick of time. Cogley launches an impassioned plea, asking to reconvene on the Enterprise so that Kirk can face his accuser: the ship’s computer itself. He argues that it’s his right as a human, and Stone grudgingly agrees. On the ship, Spock explains his findings and concludes that someone has messed with the memory banks of the computer. The only individuals who could have accomplished such a feat are himself, Captain Kirk, and…the records officer! But that would be Benjamin Finney, the man who died. Kirk says that they searched for the man after the pod was jettisoned, but Cogley really starts to run with the case. He suggests that they might not have found Finney if he didn’t want to be found, and submits that Finney is not only alive, but he’s still aboard the Enterprise. They conduct a simple experiment to test out that theory: they evacuate everyone on the ship aside from Kirk, Spock, McCoy, Cogley, Shaw, Stone, the judges, and the transporter technician. Then they use the ship’s auditory monitors to listen to every heartbeat on the ship and systematically eliminate those of the known parties with a white sound device (aka, a microphone)—and there’s still one left unaccounted for! The tell-tale heart is beating under the floorboards…Engineering section, Deck B. Kirk heads down there alone to confront Finney, while Cogley heads back to the starbase to bring back Finney’s daughter, Jame, in case the man who faked his death is crazy or desperate. Meanwhile, Enterprise’s orbit begins to decay, as it’s wont to do. Kirk finds a grizzly Finney on the Engineering deck, where all madmen hide. Finney accuses Kirk of ruining his life, denying him command of the Enterprise, so on and so forth. Knowing that Kirk’s death would mean less than the death of his ship, Finney has sabotaged the “primary energy circuits,” which is causing it to lose power and its ability to maintain orbit. When Kirk tells him his daughter is on board, the man freaks out and they fight. Even though Finney has a wrench, Kirk knocks him out easily, though his torn shirt is an unfortunate casualty. The captain manages to “effect repairs” by tearing some power cables out in a Jeffries tube, and orbit is soon stabilized. KIRK: She’s a very good lawyer. This episode was a delightful surprise. I had all but forgotten its existence, but as soon as it came back to me, I also remembered the twist ending. I suspect it was predictable anyway, but I’d love to hear from someone who just watched this for the first time, or people who remember what their original experience of it was. Admittedly, this one is a bit drier than more action-oriented episodes, but it’s still engaging and it’s interesting to see the military protocol and several aspects of both the operation of a starship and Starfleet Command in general. (Who knew there was a records officer or a personnel officer? Or ion pods, for that matter?) We’d seen a court martial already in “The Menagerie,” but there’s more of a sense of “authenticity” and formality to these proceedings, possibly because of the presence of defense and prosecution attorneys. I was also excited by the themes explored through the course of the episode. Shaw describes the trial as “Kirk vs. the Computer,” the first of many such encounters in the series. We know he will always win against the machine; even though the Kobayashi Maru test hadn’t been introduced into continuity yet, Kirk’s very character is based on his ability to cheat and best a computer program. My client has the right to face his accuser, and if you do not grant him that right, you have brought us down to the level of the machine. Indeed, you have elevated that machine above us. I ask that my motion be granted, and more than that, gentlemen. In the name of humanity, fading in the shadow of the machine, I demand it. I demand it! And in this case, they’re right not to trust the computer after all, a scary proposition when so much of their lives is controlled by them. COGLEY: I’ve got my own system. Books, young man, books. Thousands of them. If time wasn’t so important, I’d show you something. My library. Thousands of books. Rights, sir, human rights. The Bible, the Code of Hammurabi and of Justinian, Magna Carta, the Constitution of the United States, Fundamental Declarations of the Martian colonies, the Statutes of Alpha Three. Gentlemen, these documents all speak of rights. Rights of the accused to a trial by his peers, to be represented by counsel, the rights of cross-examination, but most importantly, the right to be confronted by the witnesses against him, a right to which my client has been denied. Human rights were of course a huge issue in the 1960s, and we’re still struggling with them today, too. Hopefully we’ll have it all sorted out in another 200 years, but preferably sooner. Overall, “Court Martial” is an interesting mystery/court procedural with a sense of jeopardy and tension, excellent characterization, and thoughtful themes. But I still find all those references to “Vulcanians” a bit funny now. Torie Atkinson: Like in “Conscience of the King,” this episode questions the image of Kirk as a white knight untarnished by the vices of jealousy or revenge. Is it possible that Kirk, the strength of the Enterprise and its crew, is fallible? Could he have folded under pressure? Or worse, did he maliciously send Lt. Commander Finney to his death? Shatner and Percy Rodriguez (who plays Commodore Stone) give stand-out performances and create a tension that is palpable. I didn’t believe for a second that it was possible for Kirk to be a murderer, and the episode brilliantly toys with that assumption. The computer recording didn’t persuade me, though it planted the seed of doubt, and the video really surprised me. I did a double-take (as did Kirk!). But whether it was true or not, the idea—the possibility—that Kirk could have done something like this is just as damning. When he enters the bar and gets the cold shoulder from all of his classmates, we can see that the real damage is not in the conviction but in the accusation. Kirk’s nobility of spirit and purpose have been poisoned by this event. Reputation plays a big role here, and not just for Kirk. This whole thing happened because Kirk ruined Finney’s reputation so long ago. Well-earned or not, it prevented the man’s promotion, and in many ways ruined his career. It’s clear with Kirk how incredibly valuable it is to be trusted, and how central that idea is to the goals and image of Starfleet as a whole. Areel Shaw makes it very clear to Kirk that the institution of Starfleet is greater and more important than any individual, and that they would sacrifice him on the altar of loyalty “for the good of the service.” It’s a testament to Starfleet’s supposed perfection as an institution that Kirk believes completely and unreservedly in the system, and is utterly convinced that a court martial will vindicate him. His unwavering faith in transparent justice (he refuses to allow them to “sweep it under the rug”) and commitment to truth demonstrate a nobility that’s difficult to see cracks in, even with damning video evidence. The big thing that didn’t work for me at all was the trial itself. Shaw is a stupendously bad lawyer, with a weak prosecution—all she’s got that is that since Finney didn’t like Kirk then maybe possibly it’s likely that Kirk could have not liked him back? Please. Kirk’s counsel, Mr. Cogley, is like a senile Matlock—I expected him to start rambling about his youth (or hot dogs) any second. And the conflict of interest with Areel was totally unbelievable. I will say that I didn’t guess for a second the twist ending (my guess was either that Jame set Kirk up or that Finney committed suicide because of his disgrace and framed Kirk for it). Wrong on both counts, and pleasantly surprised that I got a half-naked man-wrestling fight out of it. Simple pleasures, you know. One final note: kudos on Star Trek for the racial diversity of this episode. In addition to Commodore Stone, the episode included a South Asian man on the court martial panel and an East Asian woman as the personnel officer. Forty years later and our courts still don’t look like that. Syndication Edits: Initial chitchat between Kirk and Areel Shaw; Spock’s statement during the court martial that he is “part Vulcanian”; two sections from Cogley’s speech on human rights (though it doesn’t note which ones…); the entire sequence at the end of the Enterprise establishing a stable orbit. Trivia: Commodore Stone’s office is the same one used in “The Menagerie.” This is the first episode to use the term “Starfleet Command,” which became the standard in the Star Trek universe, and also the first appearance of dress uniforms in the series. 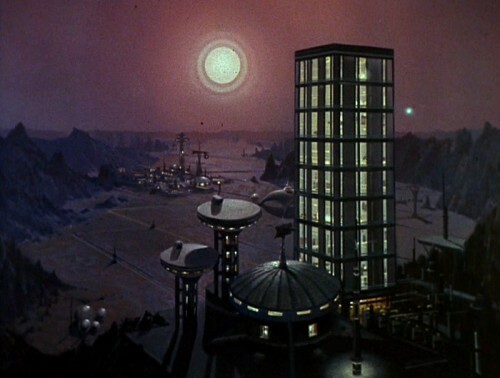 This episode is later referenced on Deep Space Nine in the episode “Far Beyond the Stars,” as a short story titled “Court Martial” by Samuel T. Cogley in the September 1953 issue of Galaxy Science Fiction magazine, which features the beautiful matte painting of Starbase 11 on the cover. Other notes: Richard Webb (Benjamin Finney) was best known as TV’s Captain Midnight (1954-1956). The excellent Elisha Cook, Jr. (Cogley) may be remembered for his performance in The Maltese Falcon and many other film noir and crime films, as well as a long career of television guest roles. Next Episode: Season 1, Episode 21 – “The Return of the Archons.” US residents can watch it for free at the CBS website.